It is with great delight that we announce our new member and first female member that joined Street Gang Photos – Italy based photographer – Mary Cimetta. Mary has a great eye to the small and unique details of the everyday life. Give her a big welcome and go our website to check her wonderful work. Felix Lupa is one of the best street photographers out there and also a co-founder of the street photography collective – Street Gang. Felix wrote a very interesting article about what makes a good photograph. It is a great read and I totally agree with Felix. Read the article HERE. A remarkable photograph must be a personal, visual report of the subject. It has to be able to tell me, using the photographer personal and unique visual language what the photographer saw and what he felt. For a good photograph it is not enough to just be a visual report, it also has to be a psychological report. It has to transfer to me the emotions and the point of view of the photographer behind the camera. Although this blog and the Street Gang collective are dedicated to street photography, I find Felix thoughts to be suitable for all genres of photography. The collective was co-founded by Felix Lupa, Sagi Kortler, Eyal Binehaker and Alex Levac. In my Street Photography Tips post I talked about the connection with the background, I mentioned how often a juxtaposition is used to tie a person to an element in the background. This type of street photography is harder then it looks, it requires a good eye, a good timing but most of all, a lot and I mean A LOT of patient. I sometimes envy photographers that produce these kind of smart and funny pictures as I lack in most times the patient to stand in one spot for a long period of time and wait for the perfect connection. When I do get to make such picture it is usually by pure luck of being somewhere at the right place and on the right time while I roam the streets. But most of my photography is not about such juxtapositions. 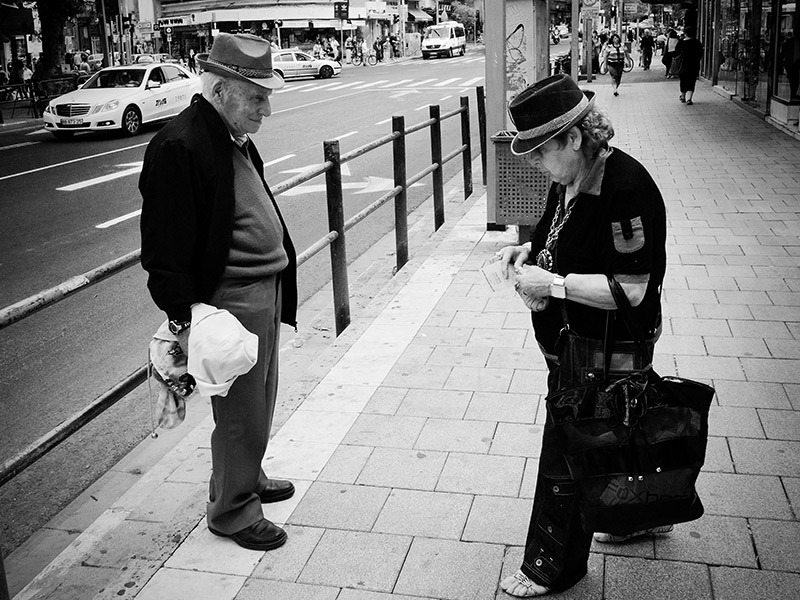 Bruce Gilden calls these images – One Line Jokes. Sure they are funny, and humor is always good and healthy but to be honest it feels a bit gimmicky to me in most cases. The usage of text signs is an issue with these type of images as it creates a very local picture that only those who can read the language can understand the picture, even if it is in English there are still many people around the world who do not speak or read English. So when I do make such pictures I only go for graphic elements that would be understood in any language. In My Street Photography I rather use juxtaposition to focus and to bring people together and tell the Human Story, even if it’s an imaginary story. To tell a story with human gestures and expressions to me is more fulfilling. By no means this is to disrespect other photographs or photographers which I truly admire, just to share my approach to street photography and what I am looking for in street photography. 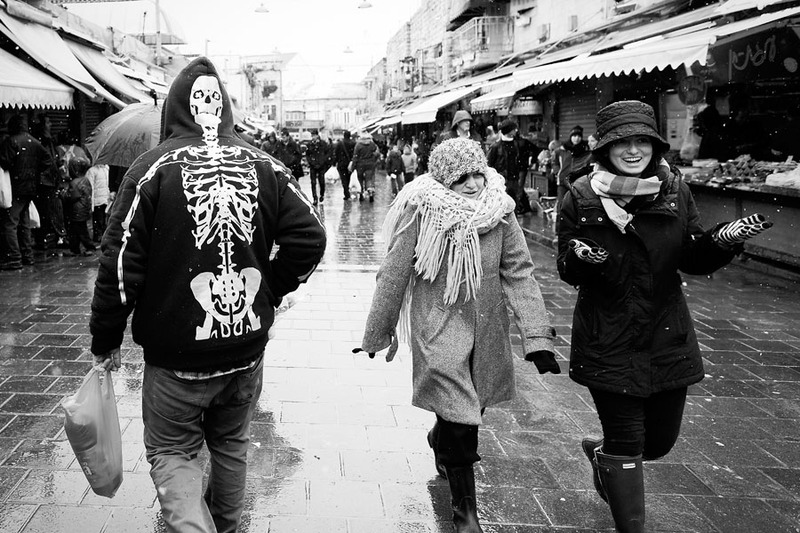 In street photography we are always on the lookout for the special moment in the mundane life. Those moments are there for 1/1000 of a second and they are gone a 1/1000 of a second later. Thinking before shooting is a luxury that in most times street photographers cannot allow themselves. 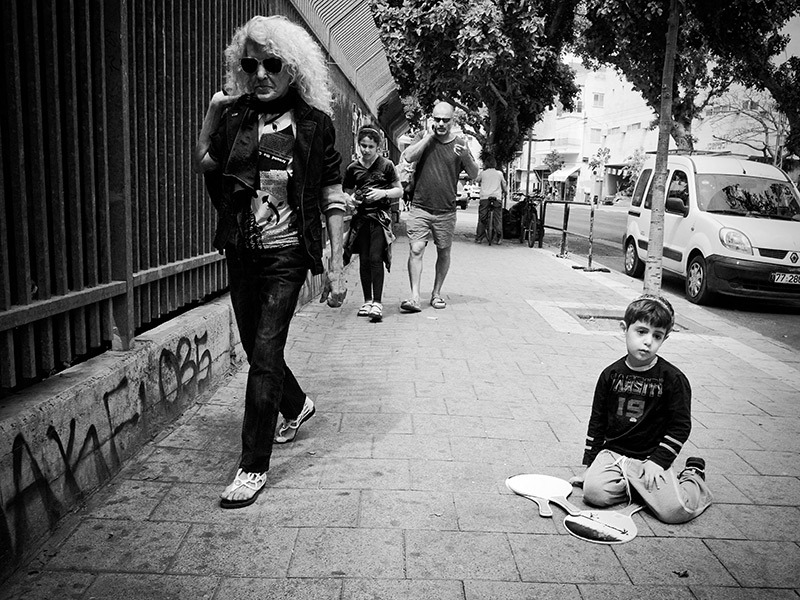 The street photographer works and shoot mostly on intuition. But sometimes the scene gives us the opportunity to work it, to explore the scene from different angles, to construct a better composition and to capture the decisive moment. The scene doesn’t have to be static, it could be a person walking that we can follow and shoot in different situations giving us a verity to choose from. Back in film days, working the scene could be expansive as development and printing cost money but today in the digital world, working the scene is free. We all know that patience is a virtue, both in life and in photography (well, photography is life), especially in street photography. working the scene requires patience. Don’t rush your photography don’t shoot just one shot and think that you got it. If the opportunity comes up and allow you to work the scene then be patience and work the scene, exploit it to the max to be sure you get the best picture possible from the scene. Don’t worry about how many pictures you took and how much disk space they are going to take, it’s all worth it if you catch that one great frame. 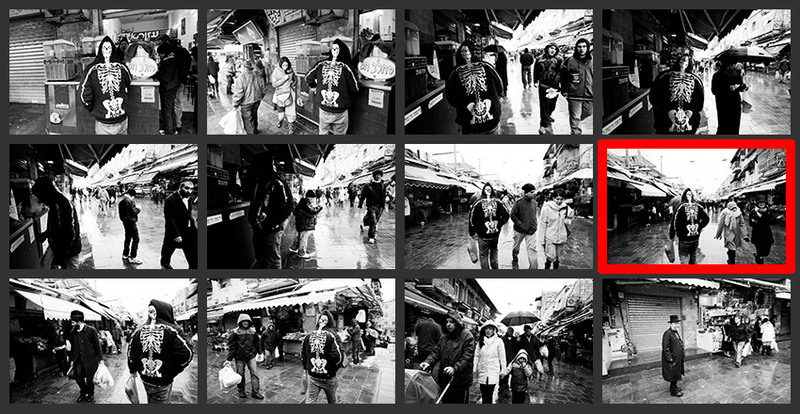 In my last post – Inspiration 001 I’ve talked about William Klein, watch the next video as he takes us exploring his contact sheets giving us a glimpse to how he worked the scene in order to get the best frame. I’ve been dying to go out and hit the streets for days now but unfortunately I’m stuck in a hospital… Don’t worry, I’m fine and probably be on my way home tomorrow (hopefully). So I decided to use this time I have to start a series of posts sharing with you some of the photographers that inspire me. It’s not a big secret that I’m into old school street photography, I think it reflects well in my work although I try to bring my own twist and some more modern approaches as well. I like to get close to my objects, I like to be involved in the scene even if it’s just for a split of a second. I have adopted Robert Capa’s famous words – “If your pictures aren’t good enough, you’re not close enough” and Henri Cartier-Bresson’s decisive moment approach but they are not the topic of this post. 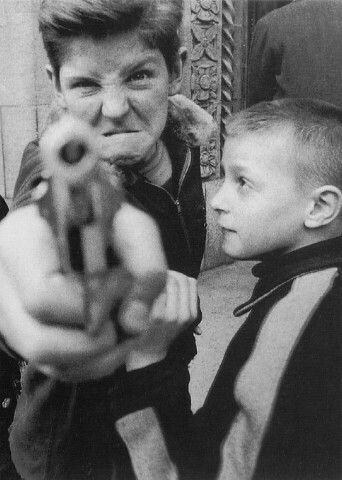 One of my inspirations is William Klein. Klein may not be regarded as a street photographer by today’s purist street photography fans, he was not very candid about his photography, often directly approaching and provoking his subjects, squeezing the emotions he was looking for. But non the less regardless of his interventions his work reflect and document the times he was working in, in a truthfully manner, giving us the viewers a real glimpse to the people and the street life of the times the pictures were taken. To me his ability to keep it real regardless of his interventions makes him a great street photographer in the purest form of street photography.